Disparities are slowly shrinking, but overall the infant mortality rate increased for the second year in a row due to increases in white infant mortality and sleep-related deaths. The regional infant mortality rate – the death of a baby before his or her first birthday — increased from 7.2 deaths per 1000 live births to 8 deaths. The regional rate remains higher than the state, which had 6.1 deaths per 1000 live births in 2013. 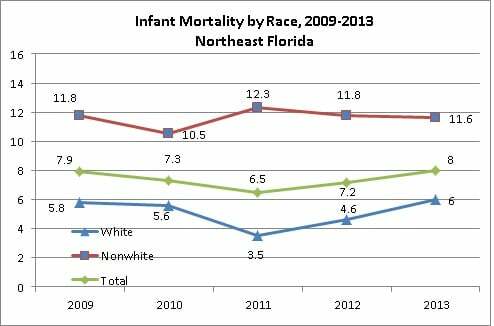 The Northeast Florida black and other nonwhite infant death rate, which typically is more than twice the white rate, decreased from 11.8 deaths per 1000 live births to 11.6 deaths. The white rate increased from 4.6 to 6 deaths per 1000 live births. While the racial gap is closing, more work needs to be done to close it further and bring the overall infant death rate down. Sleep-related deaths, which had been declining after several years of a nationwide education campaign, are on the rise again. Twenty-six babies died in Northeast Florida in 2013 from Sudden Infant Death Syndrome and suffocation and strangulation both in the bed and in other locations. Sudden Unexplained Infant Deaths (SUIDs), which include SIDS, accounted for 18.4 percent of infant deaths in 2013. 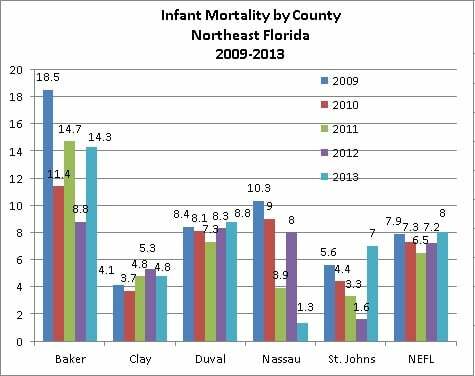 Baker County had the highest infant mortality rate in the region at 14.3 deaths per 1000 live births. Nassau County had the lowest at 1.3 deaths per 1000 live births. Rates in small counties like Baker and Nassau fluctuate significantly from year to year, as a few additional or less deaths impact the rate much more than larger counties. St. Johns County, which historically has had a much lower rate than the region, state and surrounding counties, saw a large increase — from a rate of 1.6 deaths in 2012 to 7 deaths per 1000 in 2013.